Austin is considered among the most competitive political news environments in the country and its newspaper participants already form a crowded field. Now the Texas capital press corps has a relatively new addition to its ranks, but rather than compete in print, Capitol Inside (www.capitolinside.com), is testing whether political news online can be a self-sustaining business. The Web site, edited and published by Mike Hailey, is credited with breaking news ahead of the pack, including a series of stories in 2003 about Democratic state lawmakers' departures from Texas to prevent a new congressional redistricting map from being approved by majority Republicans. The site is read widely by Texas capital power players, including lawmakers, lobbyists, journalists, state government workers and others, said Jay Root, capital bureau chief of the Fort Worth Star-Telegram. "I think it¹s really taken off," he said. The Web site includes much information that might be of interest only to insiders and not to a general audience. "I think you can get away with stuff in an online newsletter that you can¹t necessarily get away with in print," Root said. Capitol Inside is available by subscription, and Hailey won¹t reveal the current subscriber numbers. But he said there are more Republican subscribers than Democrats, a situation that is not surprising since the governor¹s office and both branches of the legislature are controlled by Republicans, the first time in Texas since Reconstruction. While economic woes across the nation have led to a decline in advertising revenue for many newspapers, the economics of running a political news Web site are still being worked through. But without the same production costs as a print product, many consider Web sites less sensitive to national economic downturns, particularly in a company town like Austin where inside political news is always sought after. Hailey brings an insider¹s perspective to the site. 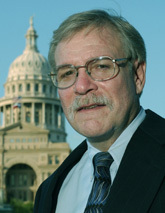 He was longtime reporter for Austin American-Statesman and the Houston Post. He took a turn through the revolving door into government when he signed on as press secretary for the late Lt. Gov. Bob Bullock (D), and then into partisan politics at the communications office of the Texas Democratic Party. He returned to journalism in 2003 when founded Capitol Inside as a business venture.